NEW LARGER SIZE! Frida Botanicals CBD Tincture is a full spectrum extract from Colorado-grown organic hemp, and includes other therapeutic ingredients from the hemp plant such as terpenes and other cannabinoids. The bottle includes a clearly marked dropper to allow accurate dosage for self-administration. 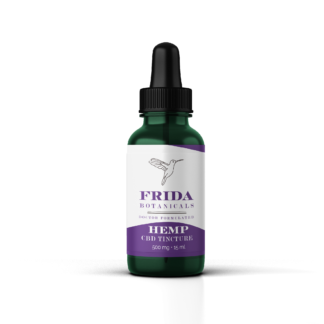 One full dropper contains 33.4 mg of Cannabidiol (CBD) from hemp. This 30 mL bottle contains 1,000 mg of CBD. Like all full-spectrum hemp extracts, it may contain trace amounts of THC (less than 0.3%). For more information on CBD, see our FAQ page.